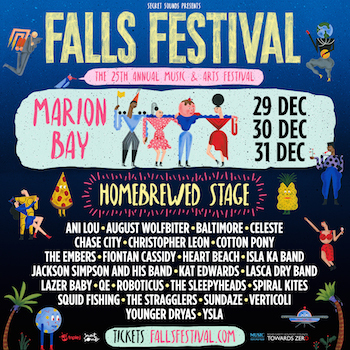 The Falls Music and Arts Festival have once again teamed-up with Music Tasmania to showcase a bunch of local acts at this year’s Marion Bay festival. This is the third year that Homebrewed has been a part of the festival and provided bands with an incredible opportunity to connect with over 16,000 music lovers during the New Year’s festivities. This year, the Homebrewed line-up will take over the Field Stage on December 29, getting the party started with some Tassie favourites, including the sweet sounds of Kat Edwards, dark electro act Q.E., ocean pop darlings Heart Beach, Launceston punks The Sleepyheads, surf-rockers Chase City, SUNDAZE, and Younger Dryas, with masters of groove LAZER BABY and The Embers finishing up the night. From December 30, the Homebrewed stage will focus on emerging talent with performances from up-and-coming acts such as Ani Lou, Isla Ka, Roboticus, Verticoli, The Stragglers, Squid Fishing, and more. The Homebrewed stage will be running for the entire duration of the festival, giving music fans and festival goers the opportunity to support a slew of Tassie talent.